"Bariatric" is a broad word that encompasses the needs of people over recommended body weight. Bariatric furniture is a necessary enhancement of the contract furniture industry for practical reasons. Heavier people appreciate wider seats for more comfort. Additionally, more substantial construction means higher durability and greater peace of mind for individuals requiring the extra support. Bariatric furnitures' wider base and stronger frames assure users that they can sit without fear of cracking frames or chair breakage. The myth of Bariatric furniture is that its unattractive and does not blend well with traditional seating. The reality is that many of the characteristics that differentiate Bariatric from traditional furniture are stylistically consistent with current trends. For example, sleek metal chair frames with warm wood accents and wide comfortable upholstered seats are exactly what is "in" according to current trends. 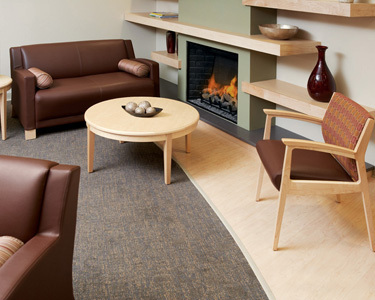 Additionally, contract furniture manufacturers have assembled collections of beautiful seating pieces that allow traditional and Bariatric chairs to seamlessly work together to create functional lounge and lobby area that accommodate people of all shapes and sizes. So what makes a chair Bariatric? Steel or heavily reenforced frames are the hallmark of Bariatric construction. Most importantly, Bariatric furniture is tested and certified to withstand high amounts of weight for a sustained amount of time. In other words, when you buy Bariatric furniture from a reputable supplier you will be investing in the right quality that will withstand heavy use and never be an embarrassment. Manufacturers and suppliers who offer true Bariatric options should be able to certify and document weight testings methods and results. Beyond seating, Bariatric mattresses are also available and are a good option when regular mattresses collapse or simply lack comfort for heavy individuals. Bariatric mattresses offer additional foam wall supports, multiple types of foam layers, and a flipable mattress construction that adds comfort over time. When planning your next furniture project remember to use a reputable contract furniture supplier with experience in your industry.